1. Slice the leek and celery using the brunoise* cutting method. 2. Heat a saucepan on medium heat, add butter and Noilly Prat and saute the vegetables until translucent. 3. Incorporate the chicken stock, bring to a boil; add peeled and diced potatoes. Check seasoning (add salt if necessary) and cook for 30 minutes on medium heat. 4. Meanwhile slice the smoked salmon into a fine julienne. 5. After the cooking time, pour the soup into a blender and add creme fraiche. Blend for 1 minute. Remove the soup into a bowl and refrigerate. 6. 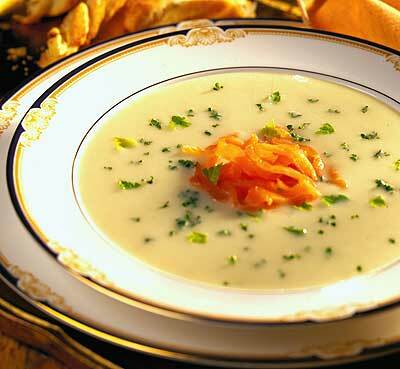 To serve: pour the soup into a soup bowl, garnish with smoked salmon and celery leaves. * brunoise [broo-NWAHZ]: A French word for a culinary knife cut in which the vegetables are first julienned and then turned 90° and diced again to create a small uniform dice. The mixture is then cooked slowly in butter or oil. The mixture is used to flavor soups and sauces or served as a garnish.